We're proud to announce the release of GeoNetwork opensource v2.6.0. This is a major release for the project that provides great new functionality, helping all those that need to publish their geographic data and services with standardized metadata. 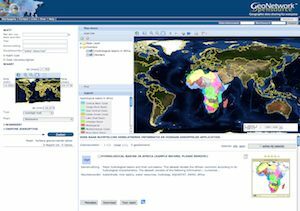 GeoNetwork opensource ( http://geonetwork-opensource.org ) is a standards based geospatial catalog application that helps people and organizations to organize and publish their geospatial data through the web. It is currently used in numerous Spatial Data Infrastructure initiatives across the world. You will find support for a number of metadata formats (ISO19115/19119 following ISO19139, FGDC and Dublin Core), a number of catalog interfaces (OGC-CSW2.0.2 ISO profile client and server, OAI-PMH client and server, GeoRSS server, GEO OpenSearch server, WebDAV harvesting, GeoNetwork to GeoNetwork harvesting support). A single, platform independent installer allows to install and run the software on a PC or a server on Windows, Linux and Mac OS X. The installer can be downloaded as an executable Windows file or as a platform independent .jar installer. It creates a Start menu on Windows computers. Command line installations are also possible for remote installations. Please refer to the manual for detailed installation instructions. GeoNetwork opensource is part of the Open Source Geospatial Foundation (OSGeo, http://www.osgeo.org) software stack, providing software you can trust tobe free, open and sustainable. Voluntary support is provided through mailing lists, websites and online forums. Several companies also provide commercial support to help organizations to implement, integrate and maintain the software. You can find them in the Service Provider directory on the OSGeo website. An extension to ArcGIS© to instantly publish data and metadata on GeoServer and GeoNetwork. See http://geocat.net for more details. Buy Bridge Standard before 30 November 2010 and get a free upgrade to our Premium edition.